We are always conscious of safety issues. 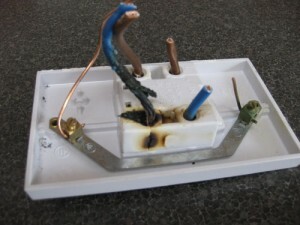 We would like to share this picture with you all, its a switch that was controlling an electric shower but it could easily have been controlling a cooker and the result could have been a lot worst. Electricity has the power to cause fires and even electric shock, it is this very reason that we only use reputable equipment. It does mean that very often we will be more expensive when quoting against other contractors, but our reputation depends on the quality of work we install. 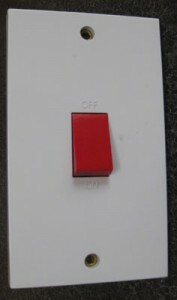 If you have a shower switch or cooker switch like this one and it either sticks or smells of burning or a fish like smell – then we urge you not to use the appliance but call out a reputable electrician to check the suspect switch. Don’t take the risk with your safety, the safety of your family and that of your home.